Austin Resource Recovery partnered with with the city’s Design, Technology, & Innovation Fellows program, and together we’ve been working since September to research, design, and test new solutions to influence recycling behaviors and perceptions. We’re now in the prototyping phase which means we’re creating low-fidelity versions of recycling services and messaging, and testing them with residents and city of Austin employees. You can read all about the process in Celine’s introduction to Rapid Prototyping and Design, and follow the Austin Recycling tag to continue to get updates. and refine and test the Knowledge Messaging prototype from round 1. The Digital Community Hub is the combination of a few concepts collected during the course of research. These concepts originated from a variety of sources including the Fellows team, various partners at Austin Resource Recovery, and residents that participated in Austin Design Week. The basic idea is a dashboard with recycling data and related information, targeted toward the “Analyst” persona who doubts her individual and community impact to the bigger picture of Austin’s recycling efforts. She perceives the cost and effort that go into recycling, reusing, and composting to be not worth it, and needs measurable proof of her actions. We spent some time sketching to decide what content and data would be on the prototype, and found ourselves overwhelmed with all the possibilities. This became the main focus of our prototype: what kinds of information does our Analyst need to see to be convinced? We decided to test this fundamental question by itself first, before working on a dashboard build. How personal do we have to go to with data change people’s behavior/perception? We hypothesized that the more individualized the data, the more connected the audience would feel to it. To test this hypothesis, we used used one of the concepts pictured above, a door hanger, a medium that we thought would be both wide-reaching and pretty easy to prototype. The challenge of this medium is that the amount of space was very small, so creating a door hanger with enough information to convince a skeptic, but not so much information that it was overwhelming, was pretty tricky. We ended up creating 4 versions before testing this one. We tested this version at the homes of 3 participants who fell into the “Analyst” persona, as well as in workspace settings such as Advanced Micro Devices (AMD) and WeWork. AMD was specifically targeted because their workforce is made up of many “analysts.” The results were very different depending on the environment. In the workplaces, the residents were generally overwhelmed by all the information. Even one statistician said “it requires too much effort, I wouldn’t give it much attention. In homes, it was much better received, but one thing we took away from the in home interviews, that the individual data was very motivating, but a little creepy. As Lori puts it, “Okay, I find this extremely helpful…but I’d be like…how do you know what’s in my trash?” They also said they would want next steps on how to do it better. 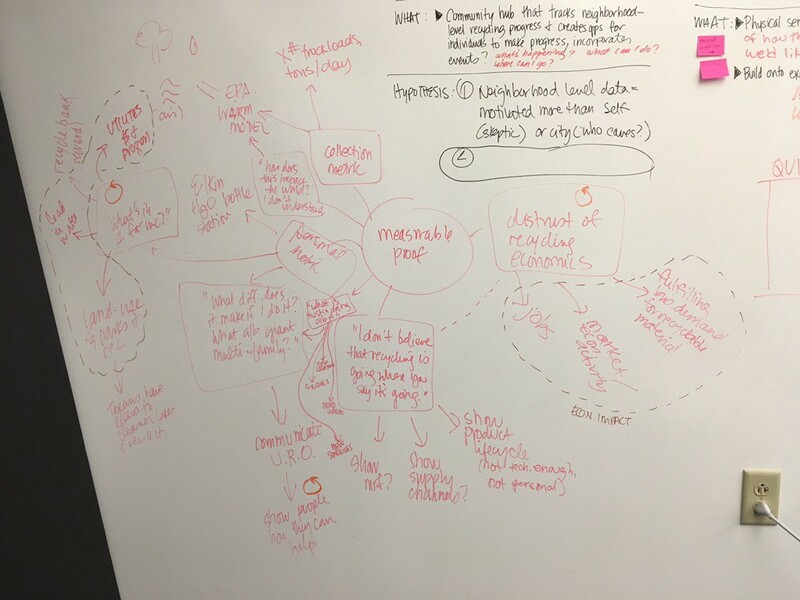 You’ll have to tune in next week to learn how we used this information to refine the digital community hub prototype and what we concluded. Last we left off, we shared that the list was outperforming the decision flow because it wasn’t improving a person’s accuracy and confidence at the same rate that the list was. We tried refining it one more time to make sure that this was because of the content framing and not the fidelity, and got the same results. We realized that a decision making process is something that requires some study, and while we see its promise as a learning tool, we’re officially ditching it as a poster. We did realize based on feedback sessions with the Austin Resource Recovery core team, that there is a clear line in “special disposal” between items you should donate and items which require special drop-off, so we redesigned the sorting guide into 5 columns instead of 4. We also changed some language, removed and replaced items that people didn’t understand, and added a link at the bottom with a link to our “what-do-i-do-with” tool because we realized after all these iterations, even though this is a list of many items, it can never cover all. We tested the poster one last time to make sure that after all these changes, it still worked. We tested the new poster in participants’ homes, and at WeWork in downtown Austin. We learned that the overall format is still working well, but the content still needs to be refined. One of our WeWork participants said “I don’t really know what ‘Special Disposal’ means…but I think a lot of people think everything is just recyclable or trash.” This showed that we are offering new knowledge, just not in a clear way yet. There is also a learning curve. At the workplace buildings where people are just glancing at the poster, it’s not as effective as it is in homes when they’ve got some time with it. We are also starting to understand that some people don’t understand that what is compostable or recyclable is specific to where you are. One couple, who recently moved from the United Kingdom, who are otherwise recycling very well, have consistently failed to correctly recycle thin plastic film and wrapping because it is recyclable in the UK but not recyclable in Austin. The next step is to get the information as accurate as possible using expert knowledge from Austin Resource Recovery. Then, we need to test it in different environments to determine what amount of information is optimal in a single family residence versus a multi-family property. We want to do this by working the sorting guide into upcoming prototypes as the missing knowledge piece. Follow the tag Austin Recycling on Medium for more updates on the DTI Fellows’ Austin Resource Recovery project! Sign up here to be a part of testing on future prototypes.